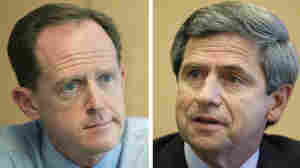 November 3, 2010  Pat Toomey, a former Republican congressman, heads to the Senate after beating Democrat Joe Sestak. Toomey was also president of the conservative Club for Growth which favors a flat tax, Social Security privatization and school choice. October 20, 2010  In Pennsylvania, the GOP so far has an advantage in absentee ballots requested and returned. That could offset the good news Democrats have received recently about the Rep. Joe Sestak closing in on Republican Pat Toomey's lead. October 4, 2010  The party has a lot of money and is spending it "profusely" in the Keystone State, says Franklin & Marshall College political scientist G. Terry Madonna. Also, the Republican threat hasn't "crept up" on Democrats as it did in 1994.